Finding Nemo is one of our favorite Pixar movies. One of us saw it 5 times in the theater and then again when it was released in 3D (hint: it wasn’t Matthew). With Pixar’s Finding Dory coming out in theaters in less than two weeks, we thought it would be fun to do a recipe commemorating its release. After going back and forth, we decided it had to be tacos but given the nature of the movie, we wanted to do something vegan. We knew we wanted to do the new movie justice by creating a recipe that could be enjoyed by meat-eaters and vegans alike. After all, didn’t we all learn that “fish are friends, not food”? Thus, the Fish Are Friends Not Food Tacos were born! Once tacos were decided on, we weren’t quite sure what route to take? Veggie? Tofu? Then it dawned on us! Gardein would be the “protein” of our taco. With the option of crabless cakes or fishless filets, we went the route of crabless cakes. 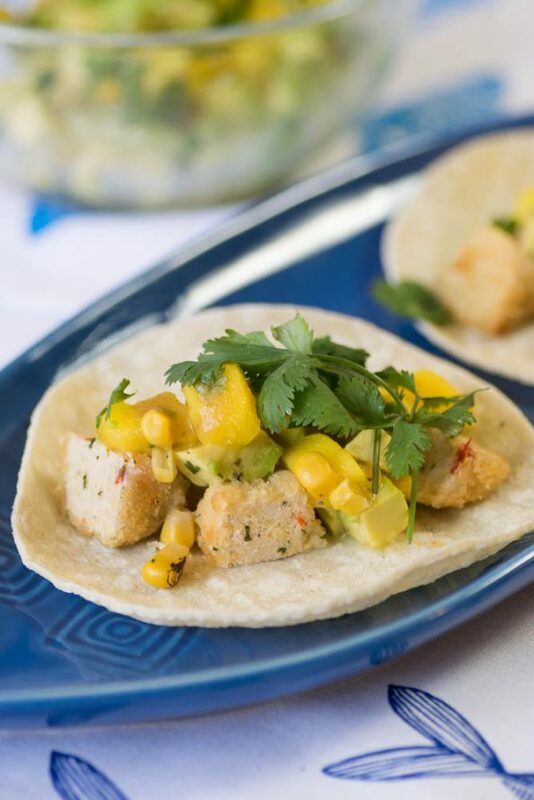 Fish tacos in general are so common that we wanted to think outside the box. “Crab” also meant we could explore more of a tropical flavor than rely on a cream sauce. After some testing and debate (very little debate actually), we came up with our avocado, mango, and fire roasted corn relish. The addition of a habanero hot sauce is completely optional and the tacos don’t suffer without it (but they do taste amazing with it!). Be sure to subscribe to our YouTube channel as we have more videos coming! Do you have a recipe that you are making to celebrate the release of Finding Dory? Leave a comment below with a link to it or use the hashtag #GeekEats and until next time, just keep swimming! 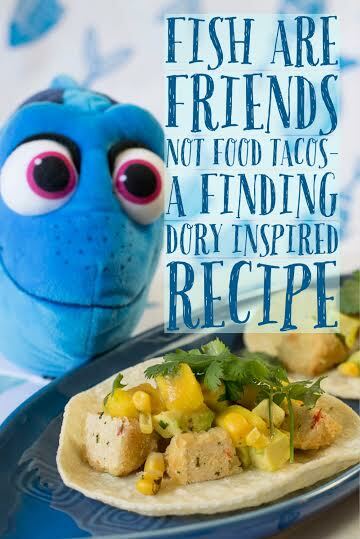 These vegan tacos are inspired by Pixar's release of Finding Dory, the sequel to the hit Finding Nemo. Cook Gardein Crabless Cakes per package instructions. Cut Gardein Crabless Crabcakes into quarters. Place approximately 5 crabcake quarters on each tortilla. Top with relish and then hot sauce if desired. This recipe is completely vegan. Oh, I love this, so creative! I can’t wait for the movie! Yum! This looks amazing! Thank you for linking up to last week’s Tasty Tuesday. I have pinned your recipe to the Tasty Tuesday Pinterest board. I hope that you’ll join us again this week. Those look very good! Perfect for a Finding Dory Movie night once the movie comes out on Blu-ray! Gardien makes some very tasty meal options.